Welcome to the NBA Live 2002 portal! 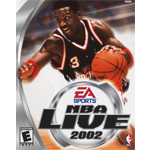 This is a central hub for all the NBA Live 2002 content here at the NLSC including news, reviews, feature articles and more. In this week's Monday Tip-Off, Andrew discusses the inevitable return to square one in basketball video games that have an annual release. Our second annual March Modness event is underway! Celebrate modding throughout the month of March, and enter a giveaway by releasing mods! In this week's Wayback Wednesday, Andrew takes a look back at the NLSC Wishlists, and the impact that they've had over the years. In this week's Friday Five, Andrew breaks down the five stages of playing through an entire season in basketball video games. In this week's Wayback Wednesday, Andrew takes a look back at some of the other bonus teams that have been featured in various NBA Live titles.